A young woman, born at the turn of the 20th century, is rendered ageless after an accident. After years of a solitary life, she meets a man who might be worth losing her immortality for. This is one of those movies I had hoped I would like more than I did. 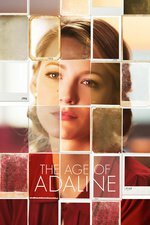 * A fine performance by Blake Lively, who seems to grasp what it might be to be that age. * Ellen Burstyn is pretty lovable, too. * It was the most truly grownup movie playing at our local cinema, and we wanted to see a movie, so it had that going for it. * The rich jackass who can cheerfully bully and buy his way into a woman's life when she is clearly telling him to GO AWAY. Apparently this is a thing that some women fantasize about. It's still irritating to find you've been stuck in the theater with this trope -- here, a guy who literally threatens in front of Adaline's library coworkers to withdraw a major donation if she does not date him. * The fact that I knew who Harrison Ford was going to be before he appeared on screen, and the fact that I knew exactly how the movie was going to end well before it did. * The terrible "Hollywood job" problem in the movie. Being an archivist does not work that way! Being an astronomer does not work that way! Oh and I hope you like everybody in your movie to be rich and white beyond all belief. * Are the old women you know all timeless and ladylike? The old women I know like loud jewelry and chain restaurants. They also tend to have a serious Fox News problem. Lively did a good job, but her character was too calm and classy, not deranged enough by the terrible burden of human life. In sum: it was a movie I saw because I wanted to go to a place, and if you, too, want to go to a place, this is a movie you could see when you go there. Are the old women you know all timeless and ladylike? The old women I know like loud jewelry and chain restaurants. They also tend to have a serious Fox News problem. Lively did a good job, but her character was too calm and classy, not deranged enough by the terrible burden of human life. This is an interesting point. My take was that Adaline's extended trips which were used to reset her personal life and group of friends and stuff helped keep this at bay, but that is admittedly my own personal opinion and not backed up (explicitly OR implicitly) by anything in the film at all. But then, I also had a problem with her continuing to return to San Francisco at all. Seems like a terrible idea if you're trying to stay under the radar. The most exceptional thing about the whole movie to me was how blatantly it rips off the style of voiceover narration from The Assassination of Jesse James by the Coward Robert Ford. I liked the idea of the story, but had absolutely no investment in the main romance. He had no redeeming qualities, and I did not care nor believe that she found him attractive. Her relationship with the dog was way more affecting. It's a shame, because the idea of a woman experiencing 100years as a 30 year old was fascinating, and it was an interesting thought experiment. I liked everyone else, except what's his face, who was just a bad "women's fantasy created by a man" cliche. The movie only started getting interesting when we have the awkwardness of Ellis' parents 40-year marriage hitting the rocks when memory, nostalgia, and pining are uncovered. The most honest and searing conversations were between Ellis' parents beginning with the reveal that William never told his wife of his love for Adaline in the 1960's. It was one of Harrison Ford's better performances. Some things to note: Adaline was obviously rolling in cash money for all the taxis she was taking. Like really, her fellow archivists did not wonder about her exquisite clothes and not having to take BART? Obviously, the best apartments with an insane level of space are in Chinatown with 6+ locks on them. Maybe her long youth locked in her rent control! Man, old people get all the luck. The cinematography was dark, as in why is the past more brightly lit while the present is low lighting. I mean San Francisco is overcast, at times, but come on. There is also a time capsule kind of quality to the technology of the movie. You have where Google is a verb and there are no ubiquitous cell phones. Also, if being a power in Trivial Pursuit indicates a weird, eternal youth then Berkeley Quizbowl is filled with Methuselahs, ah hell, I will include South Bay Stanford, too. The intense, obsessive love interest trope needs to get residuals. Ellis, in real life, would have been pretty to the point thread in askmefi of "run away" [in the voice style of Monty Python and the Holy Grail]. He comes on strong at New Year's Eve; he threatens his donation to the historical society unless she dates him; calls a great deal in a short amount of time and then gets her address from her workplace to approach her at home in less than 48 hours from their first date. "Run away! Run away!"